Explore Dallas and Fort Worth like never before on this Small Group tour. Visit the Assassination Point of John F. Kennedy, the 35th President of the United States and the JFK Memorial Monument. This 7-hour Guided Tour will get you to various fascinating and captivating places around Dallas. 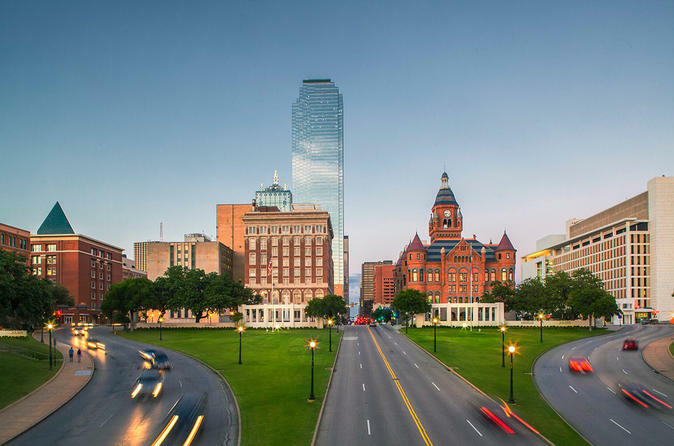 Places to visit: Founders Plaza, Old Red Court House, John Neely Bryan Cabin, JFK memorial, Pioneer Plaza (largest bronze collection in the world), Dallas City Hall (design by I.M. Pei), Thanks-Giving Square, First Baptist Dallas Fountain Plaza, Deep Ellum,The Wilson Block (historic neighborhood, Queen Anne/Victorian Style Houses), The Art District (the largest in the world),Klyde Warren Park, The City of Highland Park (5th richest suburb in USA, home to many celebrities), Uptown the McKinney Avenue restaurant district,West End, Dealey Plaza (JFK assassination Point) and much more. For many, following the process, remembering the events and pondering the theories and conclusions drawn about the assassination of John Fitzgerald Kennedy is as fascinating and captivating as it is educational. Knowing one’s own whereabouts on that infamous day, November 22nd, 1963 is one thing but actually being in the various places is quite something else. Visit the venues where a visitor to Dallas can really get a feel for all that happened when Oswald allegedly shot JFK. And what about the murder of Dallas policeman JD Tippit by Oswald, who then sprinted to the Texas Movie Theater in a panic. Visiting this site, feeling the energy of the time, is quite the experience for those who want to think about and listen to the narrative of one of the great mystery stories of our time.